This is one of the vehicles involved in a crash Friday at the intersection of SR 136 and Fair Ridge Road. 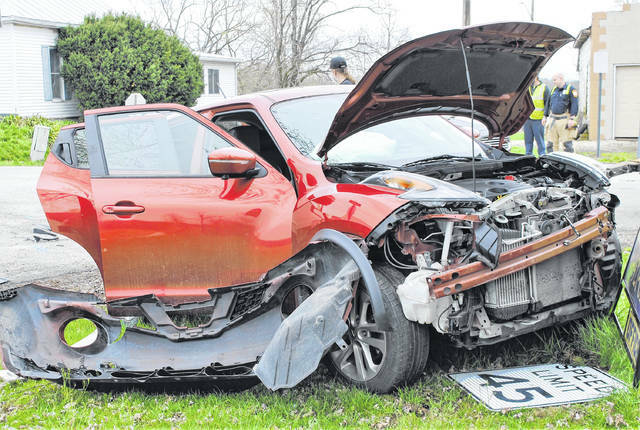 A two-car crash shortly before 1 p.m. Friday in Sugar Tree Ridge sent six people to the hospital and totaled one of the vehicles. Lt. Chad Duzan of the Wilmington Post of the State Highway Patrol told The Times-Gazette that the use of seat belts, airbags and a child’s car seat prevented serious injury to the drivers and passengers of the involved vehicles, a Pontiac Grand Prix and a Nissan Juke, which sustained serious damage. Captain David Manning of the Paint Creek Joint EMS/Fire District said responding personnel transported five adults and a teenager to Highland District Hospital in Hillsboro for minor injuries and observation following the crash, which occurred at the intersection of SR 136 and Fair Ridge Road. A witness to the accident said she suspected that one of the vehicles failed to stop at the four-way intersection. Duzan said he couldn’t speculate on the cause of the crash due to the continuing nature of the investigation.